A day after a high intensity blast shook the heart of the capital, the atmosphere around the mortuary of the Lady Hardinge Medical College (LHMC), where the bodies were handed over to their relatives after post mortem, remained somber. It was not even 24 hours past the tragedy that rocked the city yesterday when a bomb exploded outside the Delhi High Court complex killing 12 and leaving 75 injured, same security lapses were found at the new reception counter that was opened today for making entry passes. 342-kg baingan bharta to protest GM crops! The death toll due to the bomb explosion that ripped through the Delhi High Court on Wednesday morning has reached 13, with two persons-Pramod Chaurasia (34) succumbing to his injuries early this morning and Pattan (38) giving in to grievous splinter injuries. It was probably a phone call that saved Kamlesh Jha, recuperating in the C7 emergency ward of AIIMS. His family, residing in Dwarka, maintains that Kamlesh could have been grievously injured or even dead, but it was due to a call which delayed him and in the process, he had to stand in the queue behind 12-15 people. The Delhi High Court at 3 pm today held a "full court reference" to condemn the bomb blast and pay homage to the people who lost their lives. Around 60 Resident Welfare Associations (RWAs) across south Delhi and east Delhi have decided to force Delhi Electricity Regularity Commission (DERC) and Delhi government to roll back the recent 22 per cent hike in power tariff. They are not going to pay the increased charges in the coming billing cycle. Tomorrow morning is likely to see partially cloudy sky with possibility of rain. The humidity level will remain high through the day and there is a possibility of rain, said an official from the India Meteorological Department office. Students at Guru Gobind Singh Indraprastha University are protesting against the year-back system and its stipulation that they have to score minimum 50 per cent credits in the current year to get promoted to the next year. Delhi University is all set to elect its new students' union as the colleges will go to the polls tomorrow. To generate awareness about Celiac - a disorder resulting from allergy to wheat - amongst the rural masses, a medical camp was organised here yesterday by Smt Santra Devi Health and Education Trust in collaboration with experts from AIIMS, New Delhi. The scene was equally grim at Dr Ram Manohar Lohia Hospital (RML) where kin of several victims were seen moving in and out of the hospitals. Amidst the heart-wrenching situation - bodies being handed over to several affected families, including that of law student Amanpreet (21), school teacher AK Sharma whose son Rishabh and daughter Damini had come to receive his body - relatives of Pramod Chaurasia, who died early this morning at RML, were seen protesting outside the trauma building. Later, they protested in front of mortuary raising the anti-government slogans and accusing the hospital of poor management. They claimed that the hospital authorities had initially identified Pramod's body as some Pradeep from Ghaziabad and refused to give the body even after giving the correct identity. "Last night we were told by the doctors that there was nothing to worry, but he died. The doctors unnecessarily delayed in attending to MPs and VIPs even as the family wasn't allowed to see him," said the family members. There were few families who seemed to be miffed due to the indifference of the authorities saying that many were even charged for their loved one's body and in many instances they had to take them on their own as there was unnecessarily delay in arrangement of ambulance. The voice got loud with the former Youth Congress chief and chairperson of the All India Anti-Terrorist Maninderjeet Singh Bitta joining them at the mortuary. He said, "The current government hasn't learnt any lessons from its past experiences and the investigating agencies have time and again failed in their action. It is supposed to be prepared for any eventuality and offer all help to the affected, but it is really a sorry state that relatives are being charged for the bodies and ambulance service has not up to the mark." The new reception was opened opposite the former New Delhi Municipal Council (NDMC) School, gate No. 7. There was no security personnel present at the reception, though only a metal detector was placed at its entrance. Though the reception at the school had few litigants as compared to yesterday, no security personnel present was present there. Also, there was no check on the baggage being taken inside by the visitors. Even there was no security arrangement at the parking lot of the school complex. "There should, at least, be checking of people before entering the reception complex," said Rajeev Chandra, a visitor. 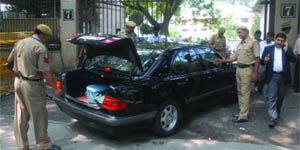 A police official at a barricade near the court said only the vehicles which had a sticker of the High Court would be allowed to enter its premises and the area outside its boundary wall. There was no proper checking of vehicles. "Don't give an excuse to allow that car to go near the court. Even a small mistake can cause a big incident," said a passerby to a policeman at the barricade. The policeman had inappropriately checked a vehicle, which was not prevented from proceeding towards the court. Anshul Tyagi, a lawyer at the HC, said the police could not always be blamed. "It is not possible to have a fool-proof system. Some people don't want to show their identification cards. You cannot blame the police," he said. DK Sharma, secretary of the Delhi High Court Bar Association, said there would be appropriate security measures in the court. "The CRPF will be deployed at the new reception tomorrow. Forty-nine CCTV cameras will be installed by the Electronic Cooperation of India at all the nine gates and along the boundary wall within the next two weeks. Already 2,000 CCTV cameras are installed within the court premises. Lawyers will be given biometric identity cards similar to the ones in the Supreme Court very soon," he said. When mediapersons asked Ramesh Gupta, senior executive member of the bar association, questions regarding the lack of security at the new reception, he said the security agencies were specialised to solve such matters. "The bomb blast is a very shameful act and the first thing that lawyers did was to take the injured to the hospitals. The police vans and our ambulance provided assistance. The security agencies know what they are doing and are trying to upgrade the security. We will ensure that lawyers abide by the rules of security personnel," he said. Kirti Utpal, vice-president of the bar association, voiced the same opinion. "We will make every effort to ensure that another bomb blast does not happen. The lawyers have always cooperated with the security agencies," he asserted. The casualty figure could climb as three patients are still critical at Ram Manohar Lohia Hospital (RML). They are in ICU: Mridul Bakshi (34) who has head injuries and fractures, Ratan Lal (58) whose legs have been amputated and Harish Kumar (41) with fractured legs. Pattran (38), who had been to the court to represent a case of Tuticorin Port Trust, was operated upon for both his legs. He was in the ICU where he gave up his fight for life today. Pramod hailed from Purnia in Bihar and lived along with his three friends, Ram Chauhan, Subodh Jha and Vinod Thakur, at Inder Enclave in Burari. 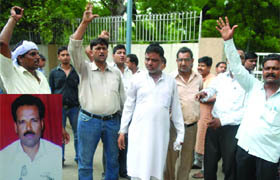 They had come to meet a friend, Arjun Jha, who had been in jail since January and was being produced in the court. Ram and Vinod had obtained their entry passes minutes before the deafening blow which left Pramod soaking in blood and Subodh with injuries in the leg. All they could recall was that a tall and stout man carrying a briefcase had entered one of the queues. He even had an argument with the security staff at the counter, following which there was roaring sound and within a minute, the man turned his back and disappeared. "They had come to meet their friend. Pramod and Subodh were still standing for their passes. Pramod who was in a serious condition died around 5:30 this morning while the other three have been discharged today," said friends of the deceased, Naim Ahmad and Vinod. Among the critical, one Mridul Bakshi is battling for life in the ICU and is on ventilator. He had sustained multiple injuries due to shrapnels from head to feet and has been operated upon. "Standing just 100 metres away, Mridul had suffered severe injuries in the face, chest, head, legs and abdomen. Doctors have said that he is critical and not responding to medicines," said Mridul's cousin Jeetendra Bakshi at RML. Then T Singh, a resident of Mehrauli, is also in the ICU and on mechanical breathing. 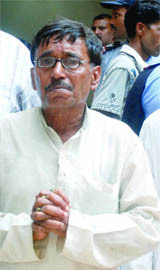 It was he who informed his wife Jaspal Kaur about the incident. "He has been operated upon for nail injuries and further tests, including ultrasound, are to be done. His nails have been removed and he is stable, according to doctors," said Jaspal's mother. The victim's family, including his two children (nine-year-old son Anmol and 11-year-old daughter Muskan), just wish to take him back home soon. Besides, two patients were operated upon at AIIMS today while four are still under observation at SH. "Around 10 am when the counter opened, everybody headed towards it for the pass. And it was due to the call on his mobile, he reached there after some time and by then a long queue of people had already come up," said his brother-in-law Sanjeev Jha at the ward. Kamlesh has a software firm and had gone to the court for a legal settlement. He has been operated upon for soft tissue injuries in his right leg. Responding in a feeble voice, he said, "About 15 people were standing before me." Ramesh Gupta, senior executive member of the Delhi High Court Bar Association, said a "full court reference" was the most sacred event in a court. Chief Justice Dipak Misra presided over the event, where all judges and lawyers of the high court were present. "Chief Justice of the Delhi High Court Dipak Misra, president of the Delhi Bar Association Amarjeet Singh Chandhiok and chairman of the Delhi Bar Council Rakesh Tiku, delivered speeches condemning the bomb blast. The event was held to pay respect to the departed souls and to give solace to the injured persons. This was followed by two minutes of silence," he said. Gupta also added that the bar association would conduct a moot court competition in the memory of Amanpreet Singh Jolly, an intern who was working with a high court advocate and was killed in the blast yesterday. "The competition will consist of simulated court proceedings, where students from several law schools will participate. It will prepare them to argue their cases," said Gupta. "Hundreds of RWAs have filed objections to the proposal by power distribution companies (discoms) to raise tariff, which were ignored by the regulatory body set up for the benefit of consumers. The tariff was hiked on the basis of self-assessed fudged data and overstatements with regard to expenditure and infrastructure costs provided by the private distributions companies, BSES and NDPL," said Ashok Bagga, RWA president, Greater Kailash (GK) -II while addressing their meeting at south Delhi. RWAs of south Delhi, including GK I, GK II, Saket, Alaknanda, Panchsheel, Defence Colony, Chittranjan Park and Kailash Colony, have decided not to pay the increased tariff. The consumers of these colonies will subtract the increased tariff and then pay the bill. "Let the private discoms disconnect the power .We will stage protests outside DERC and discoms offices. 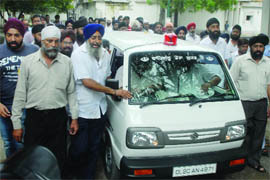 The first protest will take place on September 9 outside BSES office in GK II," said Bagga. According to the RWAs, the tariff fixation has been a consequence of the same doubtful mechanisms that have ensured that the discoms retire with huge, and in many cases unaudited, profits. "We have consistently said that the power privatisation model in Delhi is flawed, corrupted and designed to benefit companies at the cost of honest consumers," said Rajiv Kakria, president RWA, GK I. The RWAs demanded CAG audit of the discoms. "If DERC and Delhi government are so sure about the transparency of the current procedure, then why the government is not allowing CAG or public audit of accounts of private distribution companies," he said. The maximum temperature is likely to reach 33° C and the minimum temperature is likely to remain at 26° C.
Meanwhile, today there was a sunny sky in the morning which changed to partially cloudy. The humidity increased later in the day. There were also light spells of rain once or twice during the day. The maximum temperature reported at 33° C, two notches below the average for the season. The minimum temperature settled at 26.1° C, a notch above the average for the season. "The skies are likely to stay partially cloudy for the next two days and there are likely to be light spells of rain or thundershowers at night. The high level of humidity and moisture will remain for the next few days," said the official. The humidity was recorded at 92 per cent. Rainfall was recorded on Wednesday was 0.1 mm while the maximum temperature was 32° C.
The university introduced the year-back system two years ago as part of an intensive examination reform. Manish Sharma, a second year student at the university, said, "We are against the 50 per cent credits stipulation. Because of this stipulation, the university did not promote many of the first year students. This is not fair. Last year, we even approached the high court, which ruled in our favour, but still, the university has not promoted many of us. We will not tolerate this as it affects our futures. The protest will continue till an agreement is arrived at with the university." Anuradha Behl, another student involved in the protest at the Dwarka campus of the college, said, "Many of us are protesting because we have not been promoted. This is a black mark on our future. The administration is not ready to change its 50 per cent credits rule for promotion. But we prefer the old system when the credits were earned in the final year. Today, the administration met a students' delegation and we made our position clear." Meanwhile, the administration issued a statement today, saying, "After talking to the protesting students, it was learnt that they have not been promoted because they could not secure 50 per cent credits. The provision of 50 per cent credits has been clearly laid down in the ordinance relating to examinations. This ordinance has been in existence for almost two years now and it has been in the knowledge of the students." The university took a tough stance, saying that the demand for the removal of the 50 per cent-credit stipulation in the year-back system is not logical and legally sustainable. The administration said it was ready to discuss other grievances of the students. The security has been strengthened in and around the campus to avoid any untoward incident during the voting hours. The campaigning ended at 12 noon today. The polling will take place in all the North and South Campus colleges and even off-campus colleges from 8.30 am to 12.30 pm in morning colleges and from 4 pm to 8 pm in the evening colleges. The two main rival parties in the fray are the Akhil Bharatiya Vidyarthi Parishad (ABVP) and the National Students' Union of India (NSUI). The other parties, including the Student Federation of India (SFI) and the Chatra Janta Dal United, are also in the fray. It is to be seen whether an eight-time winner NSUI, which was defeated last year by the ABVP, will be able to strike back and win or will the ABVP manage to hold its current position. The ABVP had come to power in DU after a span of eight years during which period the NSUI had bagged most of the elections. In 2009, an independent candidate had won the post of DUSU president after a gap of 18 years following the disqualification of the NSUI and ABVP candidates. The chief election officer, Prof Usha Rao, and other election officials recently met the Delhi police to ensure the security arrangements. Security guards in plain clothes, police patrolling and CCTV cameras will make sure that the polling process is conducted peacefully tomorrow. Principals of all the DU colleges have been appointed as election officers. They will overlook the formalities such as the counting and the safety of the ballot boxes. For the first time, in order to make DUSU elections disabled-friendly, the university will provide information on the electronic voting machines in Braille. Until last year, these students voted with the assistance of others. Polling booths have been made more accessible with the installation of ramps at most colleges. 4. The INSO panel: Ankit Chaudhary of RSD College, Rahul Singh from Motilal Nehru College, Ashvini Kumar from Hindu College and Keerti from Ramjas College. The people were told that those suffering from this disorder might remain sick because of consuming gluten, which is present in wheat, barley and oats. Ishi Khosla, senior dietician, explained that because of the allergy, intestines of the patient get affected, which results in decreased absorption of nutrients in food. The treatment is avoidance of the foods containing gluten.